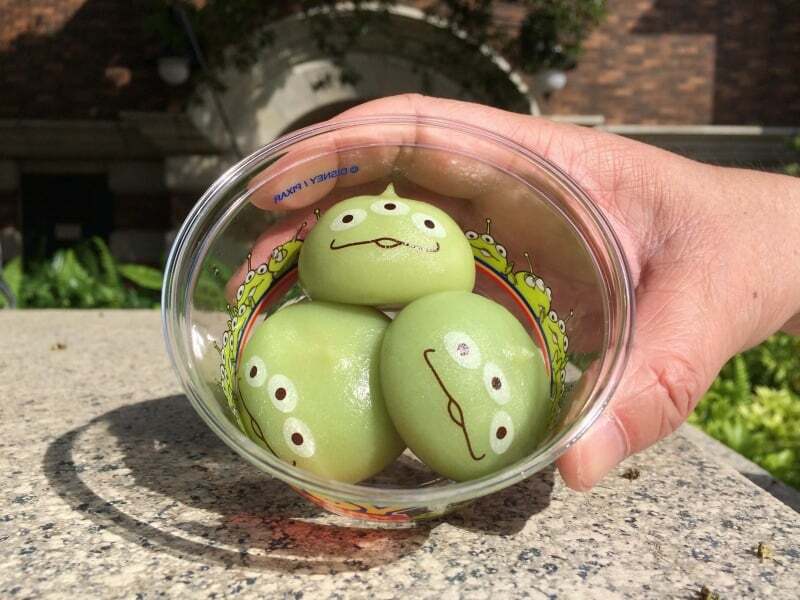 The most Instagram-worthy snack at Tokyo Disney Resort is the Green Alien Mochi, and it’s not without good reason. They are delicious, cute, and unique. Which is the perfect recipe for an immensely popular snack. 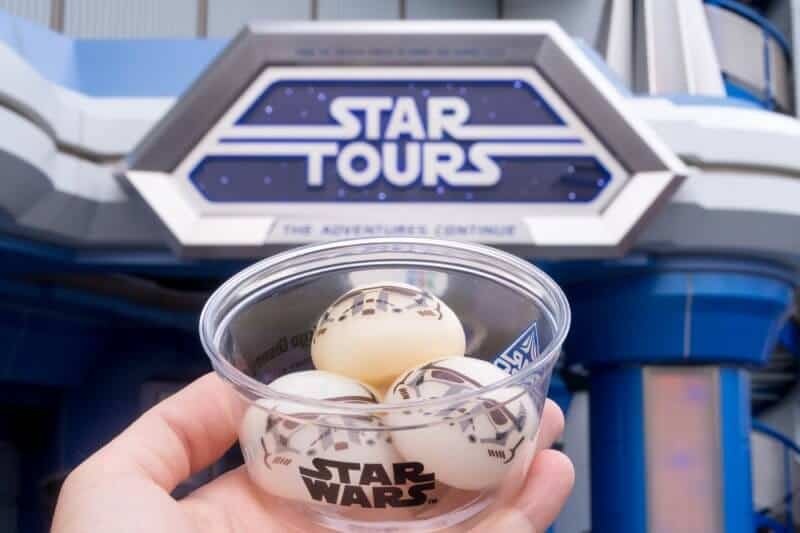 Now there is a new snack at Tokyo Disneyland and it comes from a “galaxy far, far away” (I couldn’t help myself). The Stormtrooper Mochi is now at Tokyo Disneyland as one of the many delicious snacks at Tokyo Disney Resort. Here’s my quick review of these little guys. 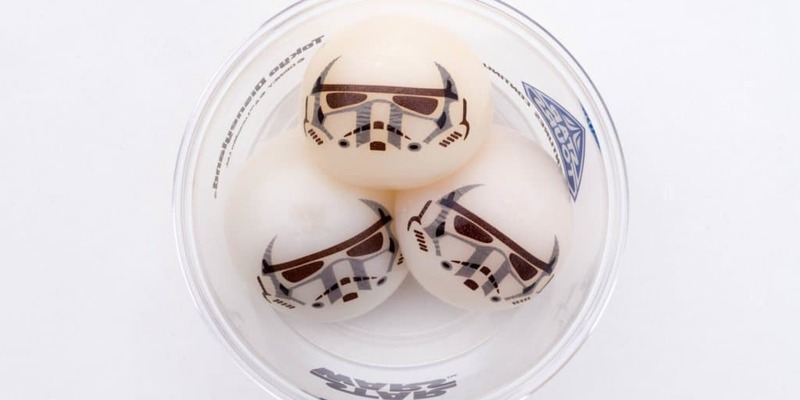 The Stormtrooper Mochi comes in a set of three, each with their own unique flavour. There’s an optional Darth Vader case too. While these are not as cute as the Green Alien Mochi, they sure taste fantastic. The custard isn’t a new flavour (one of the green aliens has this flavour) but the berry cream and milk & caramel cream are. The berry cream is delicious but my heart belongs to the “milk & caramel”, which tastes closer to butterscotch than caramel. What About the Green Alien Mochi? The Green Alien Mochi are no longer at Tokyo Disneyland (that I could see), but they are still available in Tokyo DisneySea at Mama Biscotti’s Bakery and near Toy Story Mania. It’s not clear if the Green Alien Mochi will come back to Tokyo Disneyland. The Scrump Mochi (Mango, Banana, and Purple Sweet Potato) are still available at Tokyo Disneyland at Hungry Bear Restaurant. 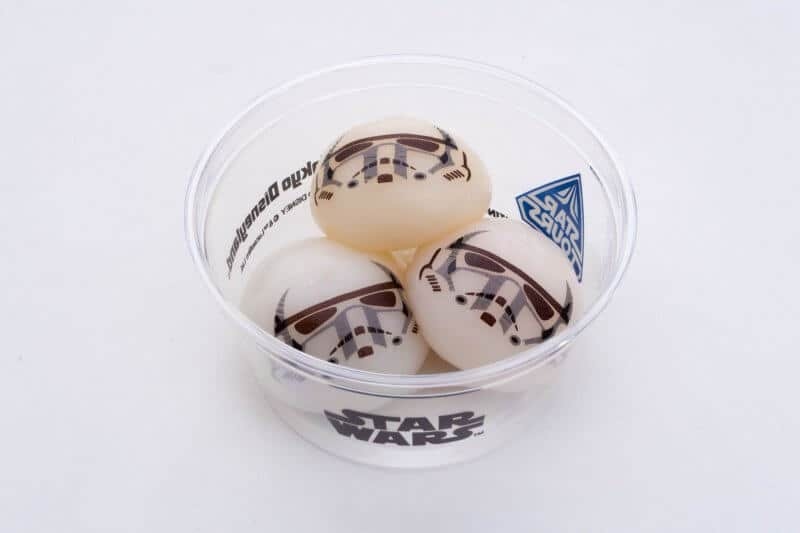 The little Stormtrooper faces are rather cute — but not green alien cute — and the packaging is nice and simple. Overall, these are a delicious addition and a nice change to the ever-popular Green Alien Mochi. I can say with confidence this is now one of my favourite snacks at Tokyo Disneyland. What do you think of these little guys? Let me know in the comments! If this guide helped with your trip planning consider contributing to our Patreon and get access to exclusive content. Also, doesn’t it feel good to help out? 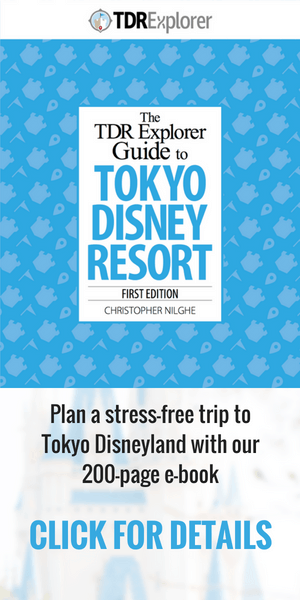 Keep up with the latest from Tokyo Disney Resort by joining our mailing list and following us on Instagram, Twitter, Facebook, Pinterest, and subscribe to us on YouTube. I’m scared to actually say this – but I kinda feel the need. This past July we visited Tokyo and could not wait to try to the Green Alien Dumplings. We were beyond excited and bought 2 orders – one in the souvenir case. To be honest – we were super disappointed. Both my daugther, 14, and I felt the same way. They were flavorful yes, but so heavy. Granted we got them at the end of the day, after we had eaten and eaten our way thru Disneyland’s fabulous foods and popcorns. Maybe late in the day the dumplings just aren’t so fresh anymore? We were so underwhelmed. Their thickness and heaviness is the best word, just did not do it for us. It seems we are the only ones who have ever felt this way. Are we??? Is anyone else brave enough to speak out? 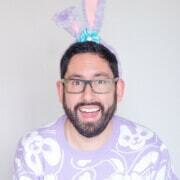 Or am I just a little green alien dumpling freak? I am in Tokyo Disneyland at the moment, and there are now 2 Stormtroopers and 1 Darth Vader in every serving of mochi. The custard cream has gone, but Darth has a darker secret: chocolate cream! It’s pretty intense, but still could not beat the milk and caramel for me 😉 I want to add a picture, bit I don’t think I can!